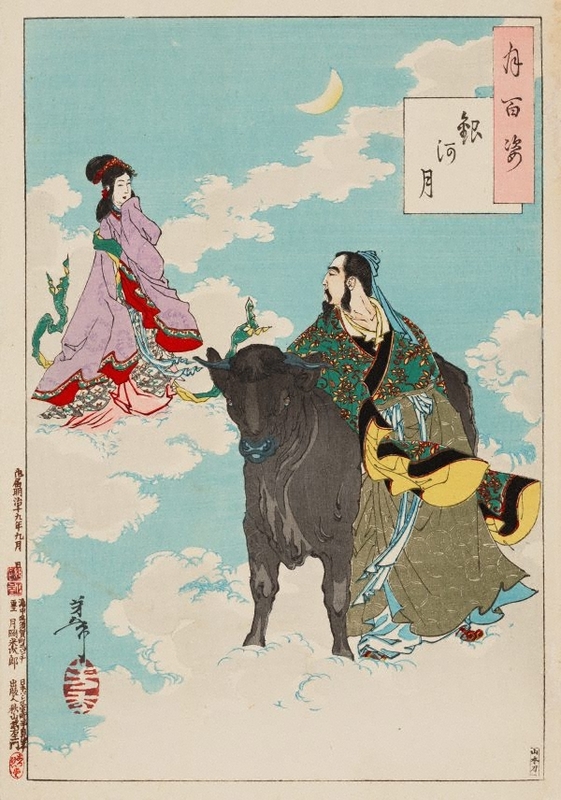 The two figures looking at each other across the Milky Way represent the stars Vega and Altair, or in Japanese (originally Chinese) mythology, the Lord of Heaven’s daughter Shokujo (the Weaver Maiden) and Kengyū (the celestial Herdsboy). Because Shokujo’s matrimonial duties led her to neglect her work, her father decreed that she and Kengyū could only meet once a year. The story is the basis of the Japanese Tanabata festival, during which young people write romantic poems and hang them on bamboo branches in front of their houses. Traditionally, girls pray to the Shokujo star for sewing skills and a faithful husband like Kengyū.